It's no secret that I love all things mystical. Fairies, trolls, pixies, elves, witches and magic. 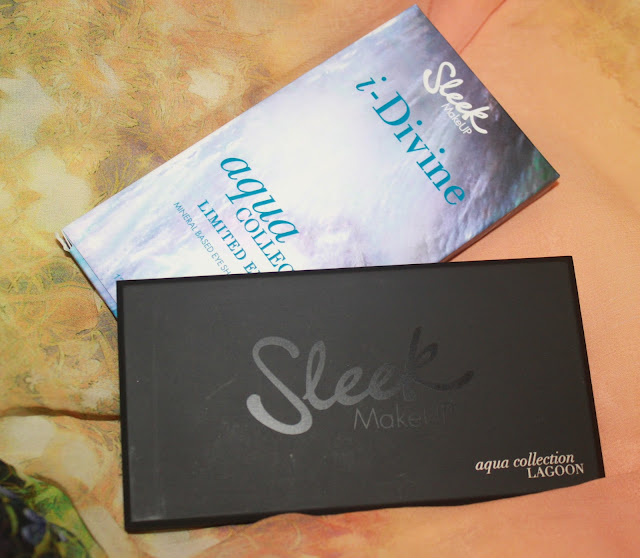 It's also no secret that I am a musical theatre student... That aside I've always loved mermaids, and when Sleek released a palette inspired by the mystical creatures of the deep I couldn't refuse. When I first opened the palette I was greeted by soft shimmery hues and deep delights. The one that caught my eye the most was the pop of the coral in the bottom right corner, appropriately named Ariel. There are 3 mattes in this collection and the rest are gorgeously shimmery shades. On the top row, L-R we have Sassea, Deep Water, Reflection, Emerald, Oyster and Black Pearl. Sassea is a bright yet soft shimmery teal that reminds me of swimming in the red sea in Egypt last summer. It has very subtle lime/gold shimmer to make this shade gorgeous. Deep Sea is a favourite of mine. This shade is a matte egg plant colour that has soft red tones to it which you can kind of see when swatched. I love using this as a crease colour with the shade Night Sky. Deep Sea has great colour pay off which I really love and is blended well too. Reflection is a very soft powder pink shimmer which looks really pretty washed over the lids or as a highlight. I love this shade and looks lovely blended with other colours in this palette. Emerald looks rather bright in the pan but only comes across like that on the lids after a few layers. It has subtle blue tones to it and looks lovely alongside Sassea. Oyster is stunning. 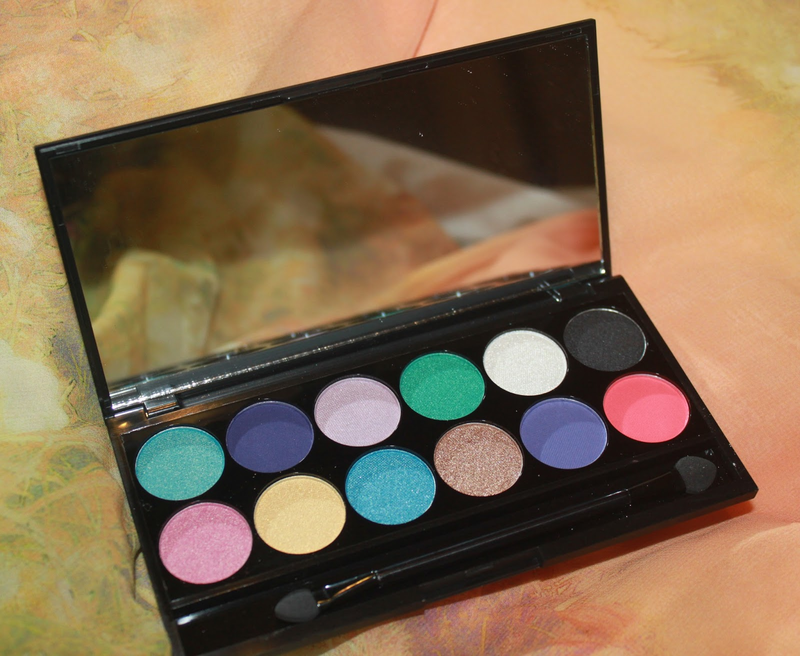 It's really well pigmented and shimmers gorgeously, picking up light effortlessly. It makes a perfect high lighter when used softly, but this cream toned white also looks lovely on its own or in the inner corner of the eyes. Black Pearl is a shimmery dark black that has brilliant colour pay off. The shimmer in this is very subtle and almost has a 'wet look' to it which I really love with this mermaid themed palette. I really love this black and I can't be more excited to use it! 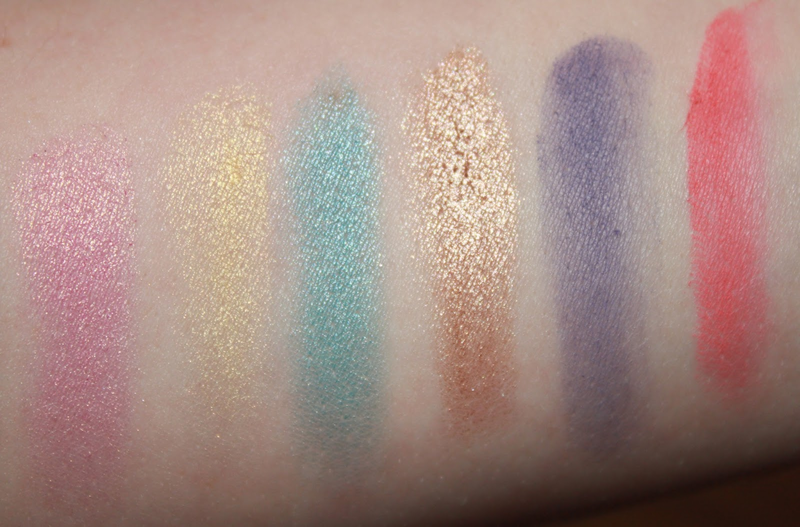 On the second row of the Lagoon palette we have L-R, Pink Jewel, Sand Dollar, Underworld, Sea Shell, Night Sky and Ariel. Pink Jewel is a pretty peach colour with gold shimmer. I really like this shade but I feel it's seen before in a lot of palettes across different brands. However I really love how buttery this feels and it has the perfect amount of gold and colour pay off. It's a perfect spring shade! Sand Dollar is a lovely antique gold colour with lovely shimmer. I really love this on the lids on it's own, but teams up perfectly with Sea Shell. I love the colour payoff and I think it's a great addition to this palette. Reminds me of a golden beach! Under World is a pretty shimmery blue that I can really imagine mystical mermaids swimming in. I like the formula of this one but I can't imagine wearing this on it's own. This shade would have to be teamed up with a few more colours. I love how bright yet subtle this shade is. Sea Shell is a bronze beauty with ah-mazing colour pay off. Personally I think it's one of the shimmery colours with the best pay off. This looks lovely as a crease/shading colour and glides on really well. I really love this colour and can see it getting a lot of use. Night Sky is beautiful. Sitting next to Ariel reminds me of a gorgeous sunset. This matte beauty has great colour pay off and glides on lovely. I love using this and I can't stop staring at it! Ariel is my favourite shade and one of the reasons I wanted this palette. I was not disappointed! It's super bright and has great pigmentation! I was so happy with this shade and have been wearing it teamed with some other colours from the palette. This shade is super bright, so if you're not a colour braver, this shade wont be touched! Overall I am a very happy Hannah. 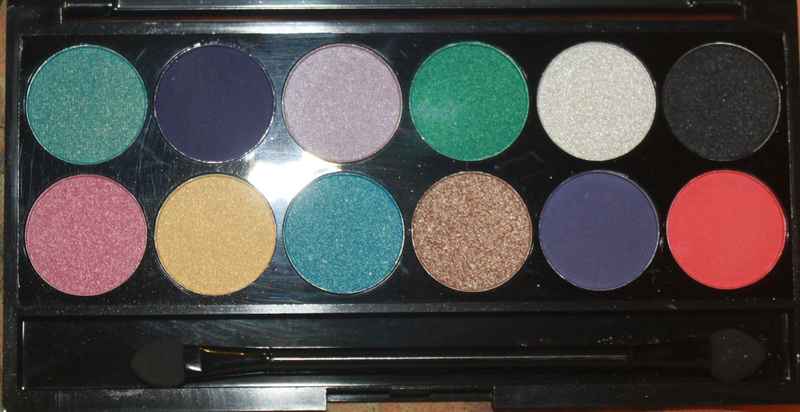 This palette has gorgeous colours with lovely formulas and shimmers. 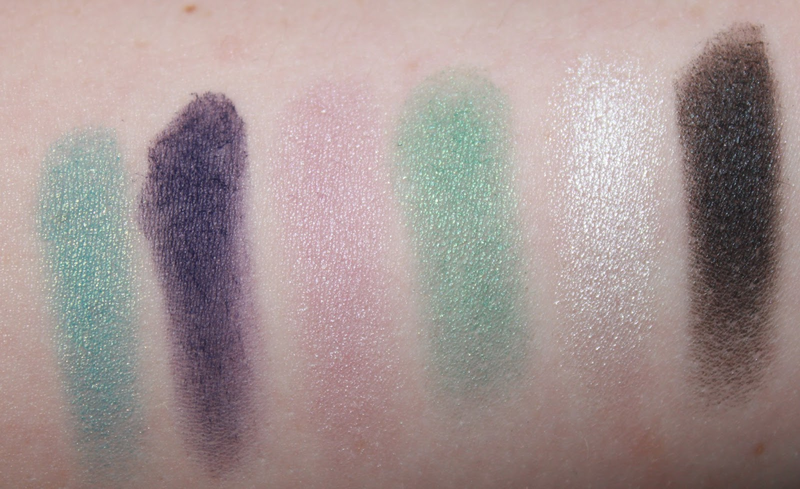 The mattes are to die for and the shimmers remind me of what could be in the deep sea... Grab this beauty for £7.99 from Sleek or pop down to your local Superdrug. Would you wear any of these shades? Which shade is your favourite and lease favourite shade. I really need to purchase a Sleek palette, every single one I see look fab! This one included! I always have a little try on all of them in Superdrug!! I can't get enough of them! I want more! Haha! These are such gorgeous colours and look so fun to play around with for summer. Too bad I'm more of a neutrals girl though.